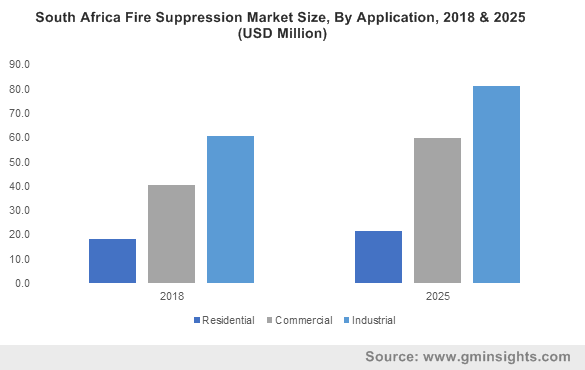 Africa Fire Suppression Market size was valued over USD 570 million in 2018 and is anticipated to surpass the installation of 24 million units by 2025. Increasing number of fire accidents along with introduction of stringent government mandates to ensure safety of life and property will foster the Africa fire suppression market. Improvisation of safety regulations to reduce the probability and associated risk caused due to fire by taking preventive measures will enhance the business outlook. Increased focused toward safety at workplace have further led to deployment of large number of units across offices and commercial buildings. Rising infrastructural spending will provide substantial growth prospects to the Africa fire suppression market. Development of smart and automated buildings with integrated fire control and prevention systems will complement the business landscape. In addition, integration of IoT and digital technologies along with introduction of quick response sprinkler system will encourage the product adoption. 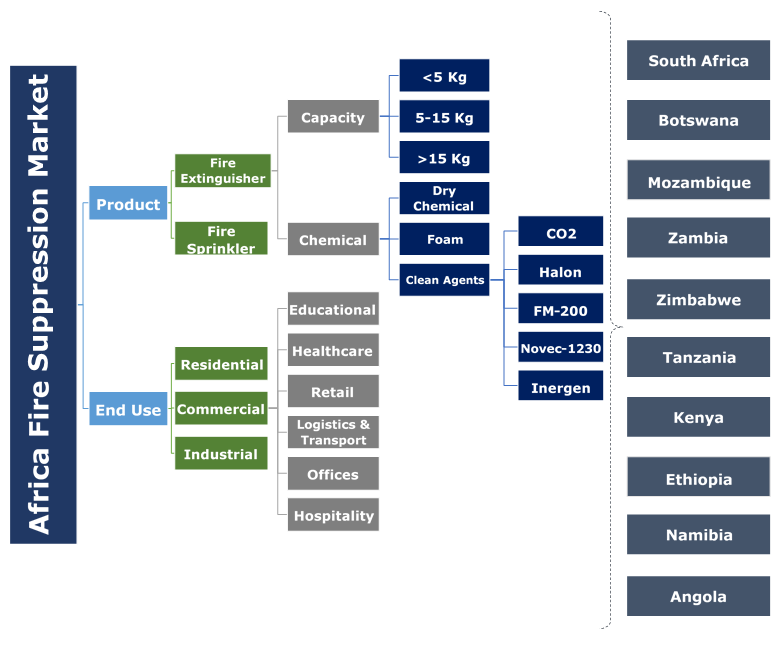 Extensive product development along with introduction of distinct variants will fuel the Africa fire extinguisher market growth. Stringent mandates toward the product installation across the offices, hospitals, retail stores and public facilities will augment the industry landscape. Furthermore, the product will witness a robust growth on account of specified industry norms and standards toward adoption of these systems across residential buildings. Increasing deployment of sprinkler systems across new buildings and commercial spaces will drive the Africa fire suppression market growth. The installation is supported by various regulations, building security requirements and incentives. In addition, the products are deployed across the apartments and private properties in order to enhance the market value. Development of varying classes of extinguisher and sprinkler systems to suppress different types of fires have provided a wide application platform to the industry. Products including, class A, B, C, D, K fire extinguisher along with wet pipe, dry pipe, foam and clean agents have complemented the business landscape. Halon and FM-200 are some of the key clean agents mostly used in fire extinguishers on account of their superior firefighting characteristics and ease of use. The residential fire suppression market is set to witness rapid growth owing to introduction of cost-effective fire control systems. Increasing spending toward R&D in order to develop low cost solutions for several consumer requirements will complement the industry outlook. In addition, ongoing replacement of existing systems with advanced sprinkler system will escalate the product demand. Escalating demand across the industries for ensuring safe execution of 24 /7 running operations will drive the Africa fire suppression market growth. Increasing cases of fire casualties owing to aging electrical infrastructure have made the industries more vulnerable to fire accidents. Introduction of various chemical suppressing agents for different industrial requirements will further stimulate the product penetration. Ongoing expansion of commercial establishments including hotels, hospitals and educational institutes will foster the Africa fire suppression market. Growing adoption of quick response sprinkler systems have provided significant reduction in the number of fire accidents. In addition, government mandates toward installation of suitable fire suppression system across sensitive areas including healthcare facilities and educational institutes will further complement the industry landscape. Rapid growth across the tourism and hospitality sector will drive the South Africa fire suppression market growth. The travel & tourism sector contributed to over USD 29.4 billion in 2018 which was about 3% more than in 2017. Growing demand across the retail outlets and public facilities have led to the installation of large number of units. The key bodies ensuring the fire safety and maintenance of fire suppression equipment across the region are South African Qualification & Certification Committee (SAQCC) Fire and Fire Protection Association. Stringent fire safety regulations along with growing focus toward establishing effective and efficient fire rescue services across the nation will drive the Zambia fire suppression market. The government of Zambia have introduced the Local Government Act, 2010 that directs to establish the fire authorities and prevention and firefighting services to protect natural resources, property and life from damage of fire. Eminent players operating across the Africa fire suppression market include Red G, Brigit Group, Fire and Security Techniques, Advanced Automated Systems, TransFire. Fireco, Failsafe Fire Projects, Safequip Pty Ltd, IntelliSEC, Spero Group, RUHRPUMPEN, Amco, Booyco Electronics, MS Fire Systems, and Akananzi. Low cost manufacturing and product diversification are the key strategies adopted by the industry manufacturers to capture a larger market share. Furthermore, collaboration with leading technological partners along with mergers & acquisitions will further help in business expansion. Fire suppression systems are used to extinguish or prevent fire across the residential, industrial and commercial establishments. There are numerous fire suppression systems that are used to blow out fire blaze in different situations that include fire sprinklers and fire extinguishers. The sprinklers utilize a pressurized water distribution piping system to suppress the fire. While the extinguishers can be divided in different classes including foam, dry chemical, CO2 and others. These are pressurized liquid or chemical filled tanks that work either by absorbing the heat or smothering the fire there by cutting the contact of oxygen from the fuel.